Of the 250 million tons of municipal solid waste produced by Americans in 2010, food scraps accounted for 13.9% of the total. In 2013, Americans disposed of approximately 35 million tons of food, 95% of which ended up in landfills throughout the United States. While in landfills, decomposing food produces methane, a gas which is partially responsible for climate change. In fact, organic matter is responsible for 16% of America’s methane emissions. While reducing food waste is a national problem that requires change on multiple levels, there are things you can do on a personal level to help. Simple changes such as storing your food properly to keep it fresh longer will help you avoid having to dispose of fruits, vegetables and meats unnecessarily. Purchasing imperfect produce will help prevent the fruit or vegetable from being thrown out by a grocer simply because it’s not visually appealing. Remember — an oddly shaped green pepper is going to taste the same as one that has a perfect shape. Another step you can take to help reduce the country’s food waste problem is to prevent boredom and frustration in your own kitchen. Cooking the same meals using the same methods can make food unappealing over time. Having to wash multiple pots and pans after making just one dinner can be frustrating, especially when remnants of your meal stick to them stubbornly. Using a steamer is a great way for home cooks and professional chefs alike to eliminate boredom and frustration. Many of the dishes you make often can be prepared just as readily in a steamer as they can in your oven or on your stovetop. Steaming can provide a new take on old favorites such as steak and potatoes, fish, chicken and, of course, vegetables. Even if you’re preparing a dish that has several components, you can cook the entire meal in a single steaming vessel. This makes cleaning up a quicker and easier process than it normally is. In addition to reducing the time it takes to clean your kitchen after you prepare a meal, steaming your food provides other benefits such as lowering the cholesterol in your meals. Steam-cooking works by using the steam created by boiling water to cook food items. Due to this process, steam-cooking requires no oil or fat to cook food. This technique reduces cholesterol even further when it comes to meats as well. Unlike techniques such as baking and frying, which seal fat in meat, steaming naturally removes fats from proteins as they cook. Preserves Vitamins and Minerals: Humans need vitamins and minerals to remain healthy. People need vitamin C, for instance, to ensure their bodies can perform necessary metabolic functions. Humans also need vitamin B to support their brain function. People need to consume certain levels of various minerals, including calcium, potassium and zinc, to maintain optimal health as well.When you prepare foods containing essential vitamins and minerals using conventional methods such as boiling or sautéing, vitamins and minerals can be damaged. When vitamins and minerals are damaged, they’re less beneficial to your body. Steam-cooking vegetables helps the vitamins and minerals they contain to remain intact, thereby maximizing the health benefits they provide. Retains Glucosinolates: Glucosinolates are components that naturally occur in various vegetables, including mustard, cabbage, broccoli and horseradish. Glucosinolates are credited with helping the human body protect itself from invasive cancer cells. These compounds are destroyed when the vegetables containing them are overcooked. By learning how long it takes to steam vegetables and paying close attention to your steamer as you prepare these items, you’ll reduce the likelihood that you’ll overcook them and lose the health benefits they provide.When it comes to glucosinolates, your ability to retain them in your food depends heavily on the cooking method you use to prepare your vegetables. 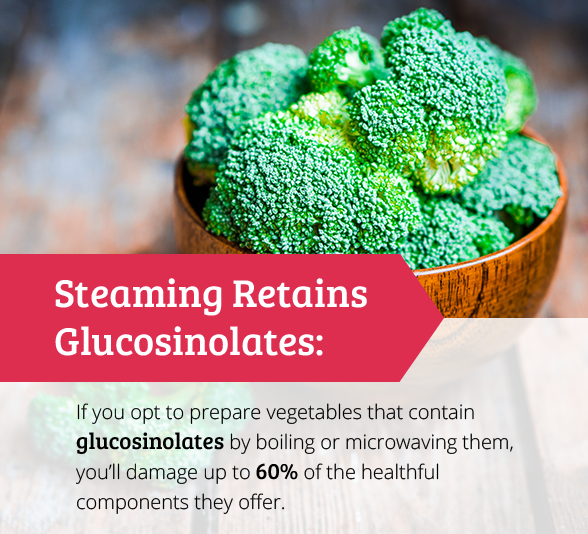 If you opt to prepare vegetables that contain glucosinolates by boiling or microwaving them, you’ll damage up to 60% of the healthful components they offer. Choosing to steam-cook your vegetables instead minimizes the amount of nutrients your food loses while it cooks. Prevents Contamination: Steam-cooking traps food’s natural flavors in it. For this reason, you don’t have to worry about the taste of one food item affecting the flavor of another, even when you’re steam-cooking multiple things at the same time.Xtrema’s FridgeX Silicone Steamer takes the prevention of cross-contamination a step further for your safety. Unlike other steamers, which have metal steaming baskets or tiers, our steamer is ceramic. Since our FridgeX Silicone Steamer doesn’t have metal components, you don’t have to be concerned about your food being contaminated by harmful trace metals or chemicals that leached from your cooking surface. Saves Energy: With steam-cooking, you can cook all of a meal’s components over a single heat source. Doing this can help you save money on your electric or natural gas bill. Using this cooking technique often will eliminate the need to use multiple burners or your oven.Our FridgeX Silicone Steamer can help you save even more money because our product is versatile enough to be used to steam food on your charcoal or gas outdoor grill! Our steamer can save you some physical energy, too. The FridgeX Silicone Steamer can go from one extreme temperature to another without having to settle at room temperature first. For instance, you can remove the cooking vessel from your refrigerator and put it directly in an oven that’s set at a temperature as high as 500 degrees Fahrenheit. Made with a non-scratch finish, our FridgeX Silicone Steamer can help you conserve the energy you would have spent scrubbing pots and pans as well because it’s easy to clean by design. In fact, you can put your FridgeX Silicone Steamer right in the dishwasher! What Kinds of Food Can Be Steamed? While you may be conditioned to automatically think of vegetables when you think of steam-cooking, steamers can be used to prepare many other types of food. You can use a steamer like ours to cook meats such as tender beef cuts, leg of lamb and pork loin. You can also use a steamer to prepare boneless chicken breasts and small whole fowl such as Cornish game hens. Steamers make cooking fish and shellfish such as oysters and clams easy as well. Believe it or not, steamers can be used to cook pasta, too! While they won’t cook prepared, dry boxed pasta, you can use a steamer to cook fresh pasta or to reheat previously cooked pasta. You can use your steamer to cook and hydrate beans as well. Certain fruits such as pears can also be cooked to perfection in a steamer. In general, you don’t want to season the food you’re going to steam prior to cooking it. That’s because the seasoning you put on your food before placing it in your steamer will probably drip off the food during the cooking process. If you want to marinate or season a food item such as a chicken breast or steak, wrap the protein in aluminum foil prior to placing it in your steamer. This will prevent your marinade or herbs from being washed away. While steam-cooking generally requires little seasoning, it does require you to prepare your food properly to ensure it cooks evenly. If you’re going to steam shellfish, make sure you clean them before putting them in your steamer. If you have a taste for shrimp, devein and de-head them prior to cooking them. If your steak or pork loin is too big to fit in your steamer as a single piece, slice it into similarly sized pieces so all of the slices will finish cooking at the same time. When you’re preparing your vegetables to be steam-cooked, it’s also important for you to cut them appropriately. Denser vegetables such as carrots take longer to cook than their less dense counterparts. If you’re going to cook dense vegetables with veggies that have less density, chop the dense vegetables into smaller pieces. This will cause them to require less cooking time. If you don’t want to cut your denser vegetables into comparatively smaller bites, there is an alternative. You can simply put the denser vegetables in your steamer first and add the others at a later point. You can either add the less-dense vegetables to the same tier that the denser veggies are on or you can put them in your steamer on a tier of their own. Now that you know what types of foods can be steamed and how to prepare them, it’s time to discuss how to use a steamer. Fortunately, our FridgeX Silicone Steamer makes it easy for even a novice cook to prepare delicious, healthy entrées and side dishes! 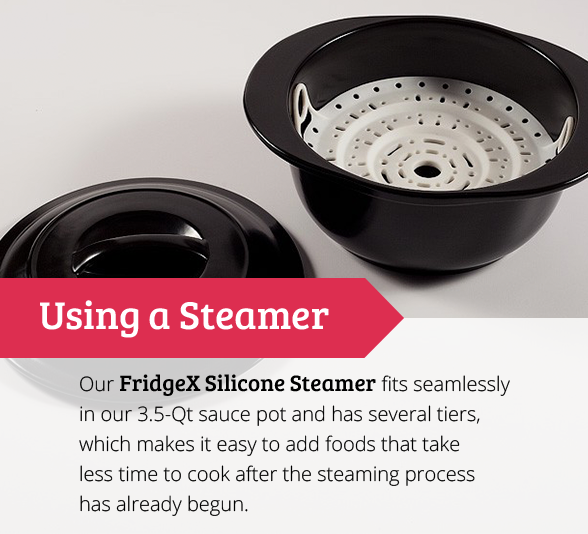 Our FridgeX Silicone Steamer fits seamlessly in our 3.5-Qt sauce pot. To use the steamer, put water in the sauce pot so it sits just below where the bottom of the steamer will be when it’s placed in the pot. Turn your heat source on to bring the water to a boil. If you want to infuse the food you’re going to cook with additional flavor, you can put some herbs or wine in the water before setting it to boil. When the water is boiling, turn your heat down to medium so your water is simmering vigorously enough to produce steam. Place the food you’re going to steam in the steamer and then put the steamer in the 3.5-Qt sauce pot. Put the lid on the pot and set a timer to go off at the approximate time your food will be cooked through. When the timer goes off, test your food to ensure it’s cooked all the way. If the food needs to be cooked for a longer period of time, set your timer to go off in two- to three-minute increments until the food is thoroughly cooked. Remember to monitor the water level in your pot to make sure there’s enough in there to generate the steam needed to cook your food. If your water level drops too low, add more water. Add hot water, if possible, so that the liquid will resume producing steam as quickly as possible. If your dish has multiple components, you’ll want to put the food that takes the longest to cook in your steamer first. Our FridgeX Silicone Steamer has several tiers, which makes it easy to add foods that take less time to cook after the steaming process has already begun. Let’s say your meal consists of a ¾-inch to 1-inch thick fish fillet, a boneless chicken breast and some chopped broccoli. Having an approximate cook time of 20 minutes, your chicken breast will take the longest to cook out of the three elements you’re going to prepare. With this in mind, you’ll put your poultry on the first tier that you’re going to put in your FridgeX Silicone Steamer. A fish fillet typically takes six to 15 minutes to steam, while broccoli only takes five to 10 minutes. Like vegetables, denser pieces of fish will take longer to cook. If the particular fillet you’ve chosen is from a denser fish, you’ll put your fillet on the second tier you put in your steamer. Depending on the size of your broccoli pieces, you’ll put the final tier holding your vegetable of choice in your steamer when your chicken and fish are five to 10 minutes away from being done. When your food is done steaming, remove it from your steamer. Our easy-grip handles and steamer tiers make it easy for you to remove your food safely! Our design will prevent your steamer from collapsing and spilling your food as well. Depending on your taste preferences, you may want to drizzle your vegetables with some olive oil or spritz some lemon juice on your fish after you’ve removed them from your steamer. Creating sumptuous meals using a steamer requires you to know more than simply how to use your FridgeX Silicone Steamer. 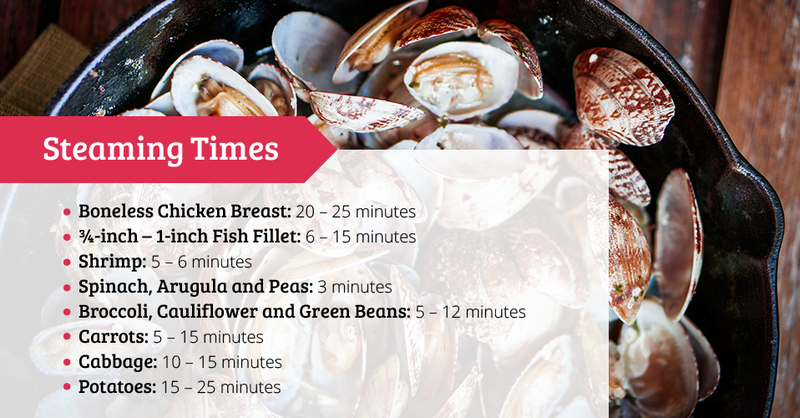 You also need to know how long you should cook the various components of your dish. The length of time you’ll cook food items depends, in-part, on your own personal preferences. If you like your vegetables soft rather than al dente, then you’ll need to cook them for a longer period of time, for example. Cooking with our FridgeX Silicone Steamer is not only simple and enjoyable, it also provides many benefits. It can help you regain your interest in cooking and reduce waste by providing you with a new way to prepare the foods you love. It can also make life in the kitchen easier by reducing the time you have to spend cleaning up after you’ve prepared a meal. You don’t even have to wash your FridgeX Silicone Steamer by hand! You can just put the steamer right in your dishwasher when it needs to be cleaned! Of course, using our FridgeX Silicone Steamer provides meaningful health benefits as well. By steaming your foods, they’ll retain more of their helpful nutrients and less of their harmful fats. By eating nutrient-rich foods and reducing your intake of fats, you can improve your overall health and lower your cholesterol. If you’re interested in reducing waste and incorporating a new cooking technique into your daily regime, our FridgeX Silicone Steamer is for you! You can learn more about our FridgeX Silicone Steamer and all of our other, 100% green products by visiting our website today!